Self contained 1 bedroom apartment, queen bed, full kitchen, wash machine/dryer. Foxtel Digital, pool, BBQ area. Rate based on 2 adults. Sleeps 1-4 pax with use of sofa bed. Extra persons $25/night. 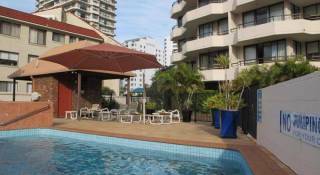 Close to Oasis Shops, Casino, Convention Centre & Beach Rates are for 2 people. Extra adults $25.00. Extra children $25.00. The room caters for a maximum of 3 adults, and a maximum of 1 child but cannot exceed 3 guests in total. 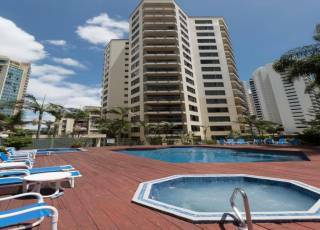 Just 350 metres from the famous Surfers beach front, Surfers Beach Resort 2 is a stylish classic art deco design building, features an outdoor swimming pool and barbecue facilities set in tropical gardens. It offers self-contained apartments with a private balcony, air conditioning and FREE covered parking on site. Being small enough to offer you a friendly welcome and personal service you’re not just a number here. 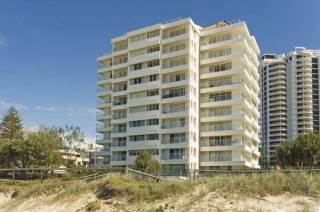 Surfers Beach Resort 2 is only 10 minutes’ walk from the centre of Broadbeach night life, cafe and restaurant strip, Gold Coast Convention Centre and Jupiter’s Casino. 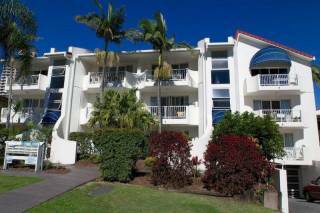 Coolangatta Airport is a 25-minute drive away. There are numerous bus services, including an airport bus, operating from in front of the property, a two minute walk and you can also catch the new Tram Service that runs the length of the Gold Coast. All apartments have laundry facilities, a kitchen with a dishwasher and microwave. Each apartment has a spacious seating area with cable TV. The tour desk can book tickets to the Gold Coast theme parks, includingDreamworld, Movie World, Sea World Wet ‘n’ Wild and White Water World. Surfers' Paradise is a five minute drive away and is highly rated by guests fornight markets, restaurants, cafes, night life and street markets. Perfect for a family getaway, our 1 bedroom apartment at Surfers Beach Resort 2 is fully self contained and well decorated with a full kitchen and private balcony. The apartments are furnished with ceiling fans, air conditioner, alarm clock, radio, clothes line / airer, opening windows, dishwasher, dryer, full kitchen, iron & ironing board, satellite / cable, TV, washing machine and dryer. The 1 bedroom apartment has 1 queen bed and bedding for extra person/s. Maximum capacity is 4 guests. Located on the top floor, this spacious split-level apartment features 2 private balconies with outdoor seating, full kitchen and laundry facilities, and a spacious living room with flat-screen cable TV. Please note that Surfers Beach Resort 2 does not accept payments with American Express credit cards. For out of hours arrivals, please contact the resort prior to arrival. For arrival out of hours same day, please use the after hours phone located at the front doors. At the time of booking your Credit Card will be charged AUD 36.30 by eTourism Holidays and $100 by Surfers Beach Resort 2. The balance is to be settled on arrival at Surfers Beach Resort 2. This total deposit is included in the room price and does not include any additional fees or charges. 14 days minimum notice for cancellations. 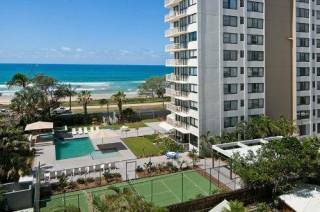 Cancellation made within 14 days will forfeit $100 deposit processed by Surfers Beach Resort 2. Cancellations made outside of 14 days will incur a fixed amount of $20. On check in, photo identification and/or a credit card is required. All our 1 bedroom rates include 2 people, There is an extra person rate of $35 pp/pn. Tariffs are subject to change at any time without notice.